Today we spent the morning repairing the seawall at the lake, which got me thinking about pier parties and this recipe will be a must for the next one we have, so get ready ladies, because I’ll be the one passing out the Patron strawberries! Wash the strawberries and cut a flat spot on the bottom of each so they will sit flat. Remove the stem and hollow out the core (best done with a melon baller). In a sauce pan, bring 1 cup of Margarita lime mix to a boil. Add the strawberry JELL-O and stir until dissolved. Remove from heat, then add the tequila and triple sec/orange juice. If you add it to the boiling liquid, all your alcohol will boil off. Spoon the mixture into your strawberry cups and place cups on a platter or tray. Freeze until set/solid. Before enjoying, let them thaw slightly. 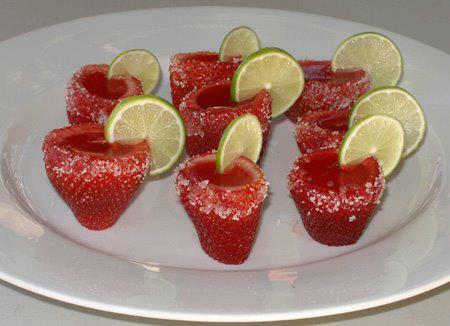 Dip each strawberry top in Margarita mix and then dredge in sugar. Garnish with a lime.